On-Street Angle Parking – A number of on-street spaces should be redesigned to take advantage of Payette’s wide 100 foot streets. As illustrated in Figure 32 the streetscape prototype calls for expanding the number of on-street angle spaces to twenty-three spaces per block. Most east / west streets with parallel parking would be redesigned to angle parking. This design allows for an excellent parking relationship with the central business area and minimizes pedestrian / vehicle conflicts. New curb cuts opening onto 8th Street should be discouraged as they can significantly reduce on-street parking and interfere with pedestrian movement. Off-Street Parking – A number of opportunities exist to develop off-street parking on vacant or underutilized space within the study area. Such areas include the southwest corner of First Avenue North and Ninth Street, the southeast corner of Center Avenue and Main Street, and areas off of the alleys located behind downtown businesses. Employee Parking Spaces – An employee parking policy should be established to encourage employees to park outside of the prime shopping district. Shoppers would have maximum access to close-in short-term spaces while employees would use more distant long-term parking spaces. Such a program requires ongoing monitoring by employers and financial contributions by merchants, employers, and the city to lease or purchase and improve nearby long-term parking spaces. Overpass / Railroad Land – This graveled lot would serve employees working in the northern part of the city center, Cider Courtyard (page 42), and the Senior Citizen Center. The lot is adjacent to the underpass between North 1st and 2nd avenues. 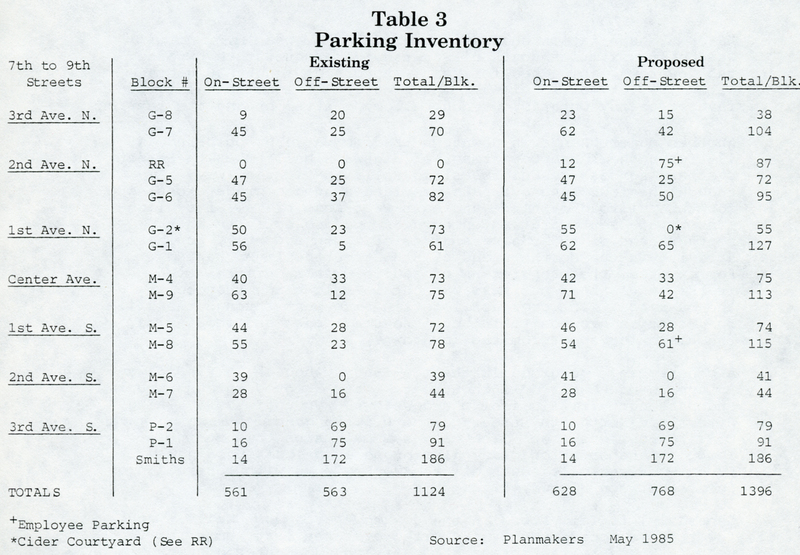 The lot, currently leased by the city from the Union Pacific Railroad, would accommodate seventy-five parking spaces. Landscaping improvements are needed at the east end of 1st Street to help buffer the overpass and connect this area to 8th Street. Southeast Corner of 1st Avenue South and 9th Street – This vacant lot would serve the southern end of the downtown and accommodate approximately thirty-eight cars. Both of these lots require signing. Parking Information / Signing / Uniform Parking Time – Periodic parking information is required to educate the public as to where parking is located and to the various regulations that relate to time zone parking. Promoting the availability of close-in and convenient downtown parking should be an ongoing activity by the downtown merchants. Another important feature necessary to increase usage of lots is better directional signs. These signs should be placed at key points specifying where parking facilities are located. Also, parking facility signs should show a unified downtown parking signing system, and short-term or long-term parking facilities should be signed as such. This uniform Parking Area sign may be used to show the direction to a nearby parking area for use by the general public. The rectangular sign shall be 30 by 20 inches or 18 by 15 inches for minor, low-speed streets. The legend and border shall be green on a reflectorized white background. To provide a uniform on-street parking program, all curb areas within the city center should be signed and enforced for a three hour maximum time limit. Shorter time zones may be set in some prime locations where quick turnover is required. With adequate enforcement and discouraged employee parking, the three hour time zones would provide adequate turnover as well as free and convenient parking for the downtown user and shopper. Parking management is an ongoing need, with parking solutions being continually fine-tuned to best serve and promote the downtown. Bicycle Parking – A number of secure bicycle racks should be placed in accessible, high visibility areas. Parking Lot Improvements and Landscaping – Downtown off-street parking lots should be paved, signed, striped and landscaped. To create an attractive shopping environment it is important that the parking lots be well screened from view by landscaping. 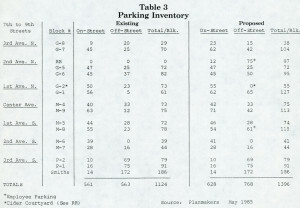 Figure 34 illustrates the type of vegetation, fences or walls that should screen off-street parking lots. A five-foot landscaped setback from property lines should be established for all downtown parking lots.